Farming Runecloth isn’t hard but there is already a lot of it on the auction house and it’s price is as low as 2 gold per stack or as high as 30 gold per stack. It fluctuates so much that I strongly recommend you check your auction house to see where it’s at before you go farm a lot yourself. If you just don’t have the money or want to farm it yourself you can do that with a max level character by running dungeons or with a level 55 character by killing humanoids. Runecloth drops from any humanoid between level 51-61. Update: You can make a lot of gold with Runecloth, but if you want to step it up and make thousands of gold you should read my personal favorite guide. 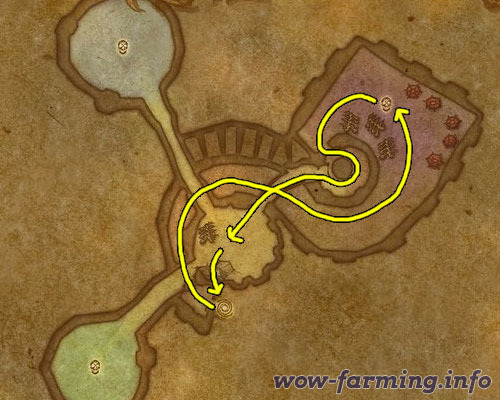 The best place to farm Runecloth is in regular Hellfire Ramparts. This dungeon is found in the middle of Hellfire Peninsula and is full of level 59-61 humanoids who drop Runecloth and Netherweave Cloth. You can enter the instance, run to the first boss, kill everything, continue your way up the stairs, kill everything and then jump down to exit the instance. If you’re an enchanter you can kill the final two bosses as well for enchanting supplies. The downside is that you might clear this instance more than 5 times in an hour. After 5 times you will be locked out from doing it until the hour resets. You will probably spend more time looting than you do killing orcs but you should find 3-4 stacks of Runecloth and 1 stack of Netherweave every 5-10 minutes. You will also pickup some nice blue gear to disenchant. 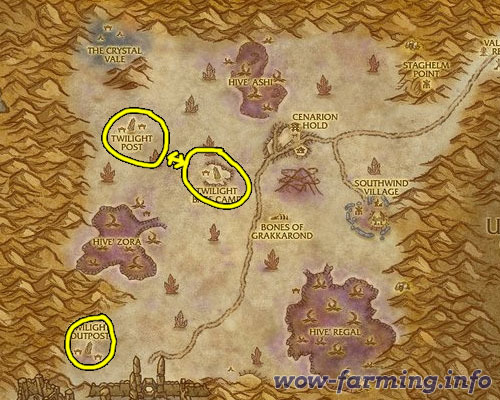 The next best place to farm Runecloth is in Silithus. There are countless twilight council humanoids who will drop Runecloth when killed. You are best off if you are level 57 or so but level 55 should work. You can kill humanoids at Twilight Post, Twilight Base Camp and Twilight Outpost all day long. 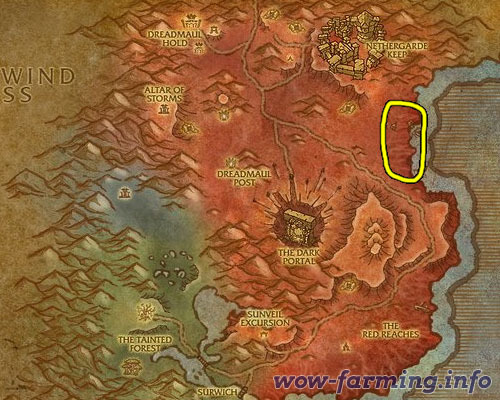 Finally if Silithus isn’t your thing and neither is Hellfire Peninsula, or if you’re too lazy to travel to either of those two places, the next best place to farm Runecloth is in the Blasted Lands north of the Dark Portal. You could clear this out on your way to Hellfire Ramparts if you wanted too. You only need to be level 55 to kill the undeads on the coast, and they will drop a suitable amount of Runecloth.